One of the greatest challenges to any army is getting food to the soldiers on the front line. 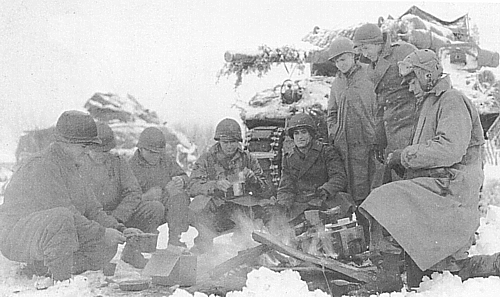 Without the "luxury" of established mess halls and a relative variety of hot food prepared by teams of cooks, combat soldiers are limited to easily prepared and transported meals  i.e., canned and dried food in a box (or, today's "meals ready to eat" MRE's in a pouch). The field rations of the 1940s were a compromise between caloric and nutritional specifications, suitability for mass production, and need for compact packaging. Most GI's would suggest that flavor and variety were way, way down on the list  if there at all. 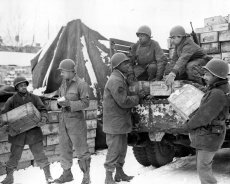 WWII ration cartons often appear lashed to the surface of a tank or halftrack. For the modeler, they are one of those ubiquitous bits of detailing that lends realism to an AFV or diorama. But because there are several types of WWII rations, there are a couple of considerations for how to use them with your model: the specific use of each type of ration, and the relative accuracy of the scale reproduction. While creating the battalion aid station in my Hurtgen Forest diorama and wanting to litter it with discarded rations boxes, I became much more aware of the different products on the market. The lack, at that time, of individual K-ration meal boxes led me to create my own, based on research photos. Because of the significant differences between the same style of cartons from one aftermarket manufacturer to another, I decided to determine which products are the most accurate. This article should give you some idea of the range of products and how they compare to actual rations containers and to one another. From this information and the photos of the completed boxes, you can draw your own conclusions and make a better informed purchase. 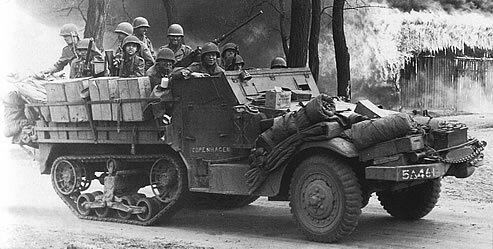 Most of the historical information and many of the ration images of the war era were drawn from the very interesting U.S. Army Quartermasters Museum website. Luther Hanson of the Quartermaster Museum kindly provided me with additional Army documentation. I also received valuable assistance and photos from Gerald Peterson, who offers lifesize reproductions for re-enactors at his site WW2 Ration Technologies, and Alan S. Batens, founder of the Belgian WWII re-enactors group, Strictly GI. Below are links to the main ration types and their 1/35 scale equivalents. The products are grouped and compared by their primary packaging features, particularly size and how they are labeled. For some odd reason, manufacturers tend to label 10-in-1 rations as C rations. So, while a product may be called "C Rations," if the cartons themselves are marked as "10-in-1" they have been placed in the 10-in-1 category for comparison. Overall, Hudson & Allen Studio containers come out on top in their categories. Their items, which were previously released under the Pre-Size brand, are closest in size and labeling to their real-life counterparts. Extra Detail's individual K-ration meal boxes were recalled by the producer because they were significantly oversized (I made my own for my Hurtgen Forest diorama before their items came out). Those products from Custom Dioramics, Verlinden, DIORART, and Tamiya have some major flaws. And the Plus Models cartons are really not worth the paper they're printed on. In looking at the Army documentation on these cartons and wooden boxes, it quickly becomes clear which of these manufacturers did their homework.